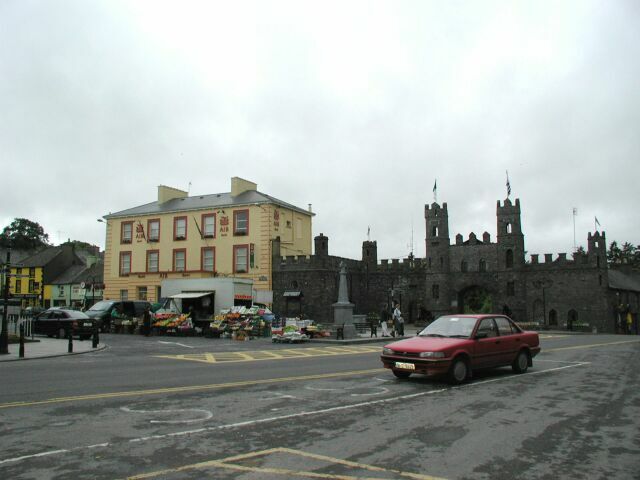 It was Saturday morning in the little market town of Macroom. When I ordered eggs and bacon, the waitress looked crestfallen. “You mean you don’t want the full Irish breakfast?” Like this was an affront to their country. Len was having his usual difficulty explaining how he wanted only the whites scrambled, and she looked like she was trying to memorize this new recipe. Then Len asked about whether the bacon was really bacon, or was it ham? With a puzzled look, she said, “Well, it’s bacon, isn’t it?” She was trying really hard to please, but didn’t feel like she was succeeding. Of course we would call it ham, while they called it bacon. It was the same everywhere. We asked at the desk about the two things we needed before we left town, both as a result of yesterday’s disaster. I needed a pump before I could go anywhere, and Len needed new sunglasses. The day was overcast, which we had already come to expect, but Len felt that he needed the protection for his eyes against wind and insects. The woman assured us that there was a bike store in town (for which I was most thankful), and that there was an optician only a few doors away. We asked what time the bike store opened and she picked up the phone. “Hello, Liz?” she said. Len and I smiled. It was that kind of small town – like in the days when people talked to the telephone operator who knew everyone and made the patchboard connections. The bike store didn’t open for a while, but we found the optician already open for the day. A nice looking middle-aged woman, who was dressed quite fashionably, served Len. Here we were, in a small market town in the foothills of the mountains on a Saturday morning, and she was dressed like she was going to some Junior League function. I thought it was charming. Len bought some quality sunglasses, and we wandered up the street, looking for the bike store. We had been told that it was off the street in a mall, but we were having trouble finding it. The whole town was only a block long, so wherever the store was, it was well hidden. I kept wondering what the word “mall” meant here -- surely not the same thing as in New Jersey. In the center of the “Y” where the road split a fruit and vegetable market was being set up. Len bought some fruit, and urged me to do the same. He said that Stella had told him that I should have fruit. Then just beyond the fruit stands we found the entranceway to a little passageway that had a few small stores, among which was the bike store. It was the time that it was supposed to be opened, but of course it was locked. There was a man dressed in old clothes standing by waiting. A little later the storeowner showed up with his daughter, who was perhaps ten years old. It seemed that the man who had been waiting outside also worked there. All three of them began to ready the tiny store for business. The store itself was full of used bikes, so there was no room to enter. In fact, their entire inventory seemed to be old, cheap used bikes. The little girl began hauling the bikes out to the passageway and setting them up for sale. She did this with such a diligence that both Len and I talked about it afterwards. Here it was, a Saturday morning, and she was working hard helping her father with this tiny store in a little alcove. It still warms my heart to remember it. When enough room had been cleared for us to enter, I explained my pump problem, and the owner pulled out the exact attachment that I needed to convert my pump to the correct valve. It cost about a dollar. I almost wish it had been more expensive. 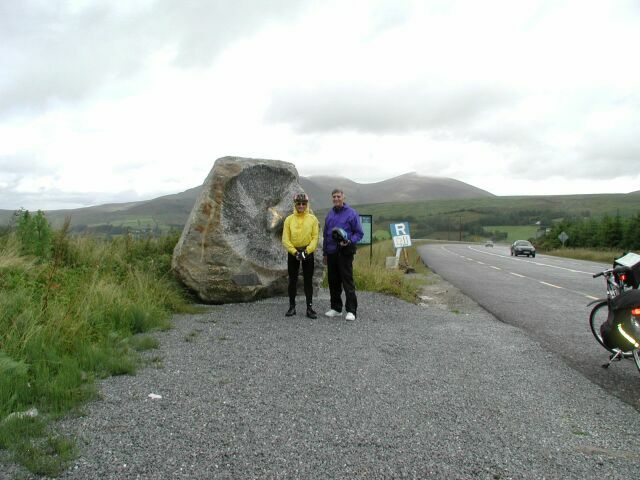 We told the owner that we were heading for Killarney, and asked his advice about which of the two possible routes we should take. 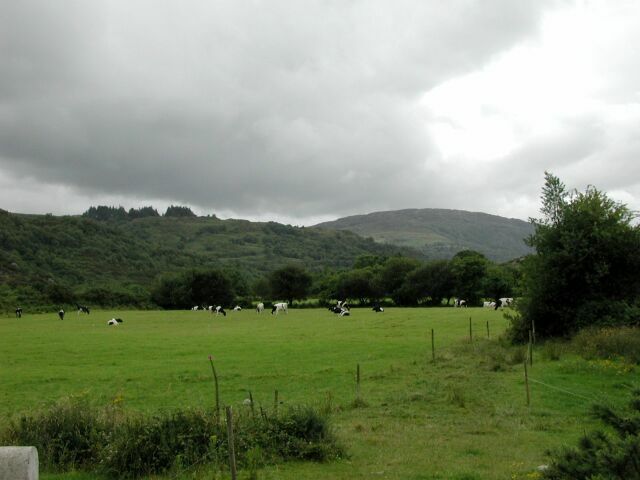 I had originally planned on the longer one, which went north around the mountains before heading west to Killarney. The other route cut diagonally across the mountains and was the main road. I had been afraid that the traffic on that one might be prohibitive for cycling. 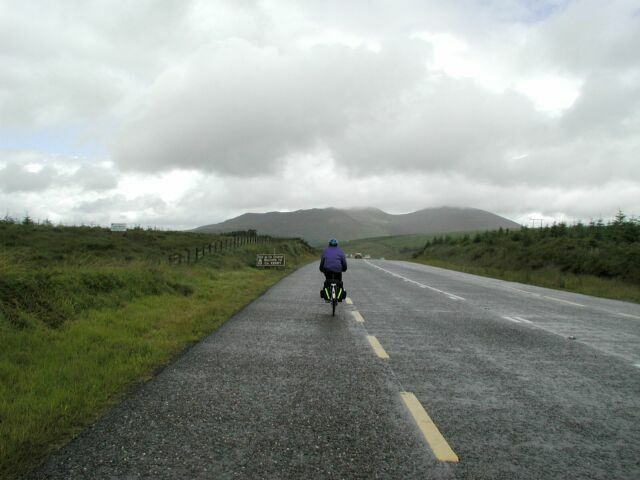 When we said we were cycling to Killarney, the other man conspicuously crossed himself. Len glanced at me. What were we getting into? In thinking about the trip and studying the maps beforehand, I had always worried about this particular day. It looked like the hardest day, as the map showed a terrain covered with mountains. The two possible routes threaded their way through valleys and across mountainsides, but the gradient contours were so close together that it wasn’t possible to see how hilly the roads were. Especially after my experience with hills on the first day, I was dreading how bad this day might be. The owner said that we should take the main road. “That’s better for bikes?” I asked. “By far,” he replied. I wish I could trill the “r” in “far” as he did, but the emphasis wasn’t lost on me. There wasn’t any doubt that we should take the main road. I pumped my tire up, and we walked our bikes through the busy little town. Leaving the town to the west we crossed a little bridge and began biking. I was much better prepared on this day than I had been the day before. Having adequate pressure in the back tire seemed to make pedaling much easier. Also, I packed the panniers well on this and all subsequent days. I used two plastic laundry bags from the hotel to hold clothes, and then put one bag into each side of the panniers, where they fitted perfectly. Then I was able to fold up my duffle bag and put it inside the panniers on top. Much to my relief, also, the muscle pain I had experienced the night before in climbing the hotel steps was gone. It never reappeared during the rest of the trip. 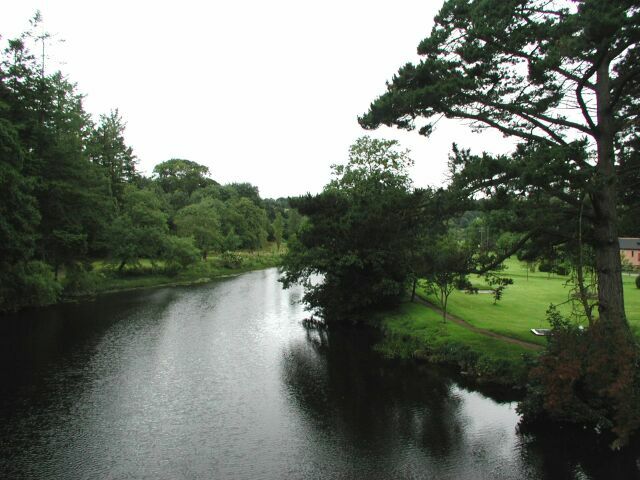 On the other side of the Macroom bridge was a pretty park. The castle overlooked this little river and manicured grounds. 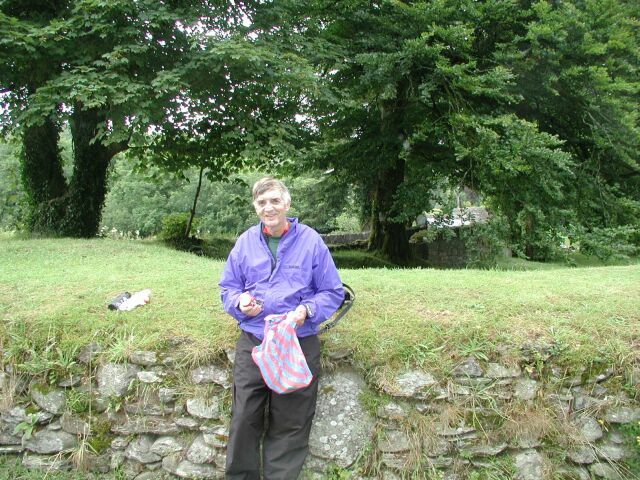 We were entering a part of Ireland that is littered with ancient monuments. My Ordnance Survey map showed quite a number of standing stones, stone circles, and megalithic tombs near the road that we would be biking. So as we started out I set my GPS to output Irish grid coordinates in order to locate some of these artifacts as we traveled. Right below the geographic coordinates on the GPS display is the elevation – 40 feet when this picture was taken. In the three years since I got this GPS I had never paid any attention to the elevation. Where I live the elevation would randomly read something between 0 and 30 feet, and I never thought it was the least bit accurate. It didn’t matter anyway, since I live in flatland. However, this was the day that I began watching the elevation on the GPS, and I found as we biked to higher elevations that the GPS was quite accurate. I could check this by the elevation markings on the map. Additionally, Len had a large watch that read elevation based on barometric pressure. 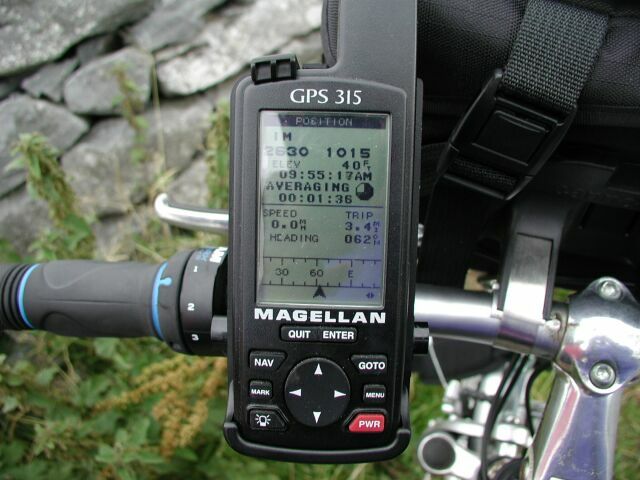 As the days went by we compared the three readings – map, watch, and GPS. Usually they were within about 10 feet of each other. 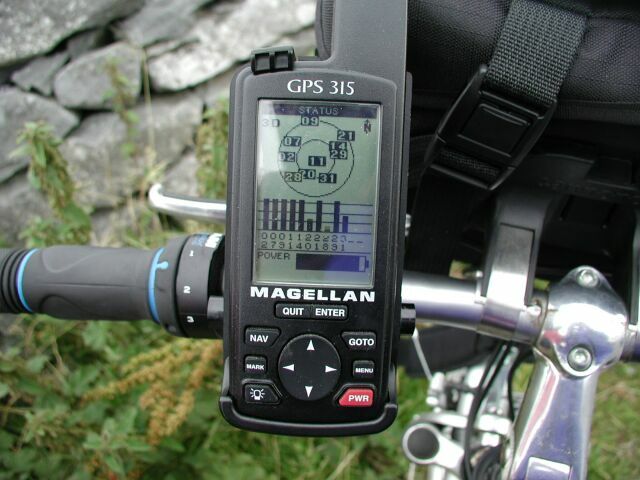 As we biked along the GPS gave me an estimate of its position error. It said zero. I don’t think I had seen that before. The way the system works is that it times the signals from all the navigation satellites that it can find. If it sees only one satellite, that defines a great circle around the earth. Finding two satellites means that it can narrow this to one of two antipodal points on either side of the earth (the intersection of two great circles). With a third satellite it can locate the exact position, but there is some inaccuracy since the clock in the GPS is not absolutely accurate and the earth is not perfectly round. A fourth satellite enables the GPS to estimate elevation and to narrow some of the errors. There are 24 satellites in the constellation and they cover the whole earth in low earth orbit. In New Jersey the GPS usually sees four or five satellites. However, look at the display in Ireland. This shows the signal strengths of satellites in view, and that it is currently receiving from 10 satellites of the 24 in orbit. I had never seen so many satellites indicated on the GPS. No wonder it thought that the estimated position error was zero! While I’m mentioning the GPS, here is an example of the path shown on the display. The curved line is our intended route, as uploaded earlier from the map software. The arrow in the middle of the screen shows our current position and direction, and the big dots are landmarks that I have noted from the map, such as crossroads, towns, etc. You can see that the scale is about 5 miles between the dots in this example, but the scale can be easily changed at any time. 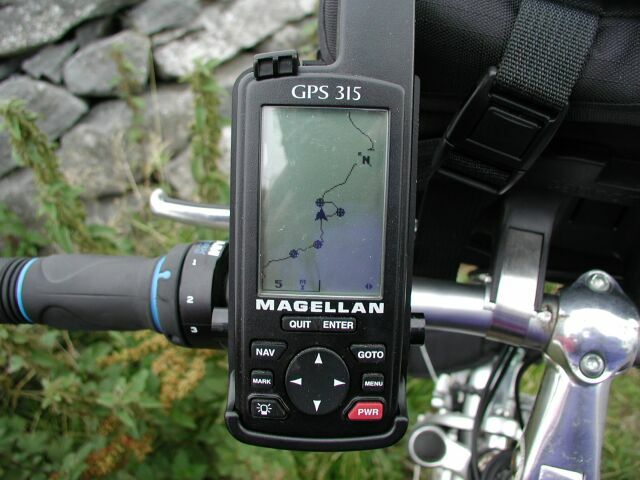 Sorry to run on about the GPS, but it’s a terribly clever system. I have two old friends who each claim to be the father of GPS. One of them managed the program in the Defense Department, while the other was the scientist who conceived the system. Each of them minimizes the other’s contribution, and I don’t think they speak to each other any more. What else would we expect? So with all that technology, how could we fail to find the ancient artifacts? 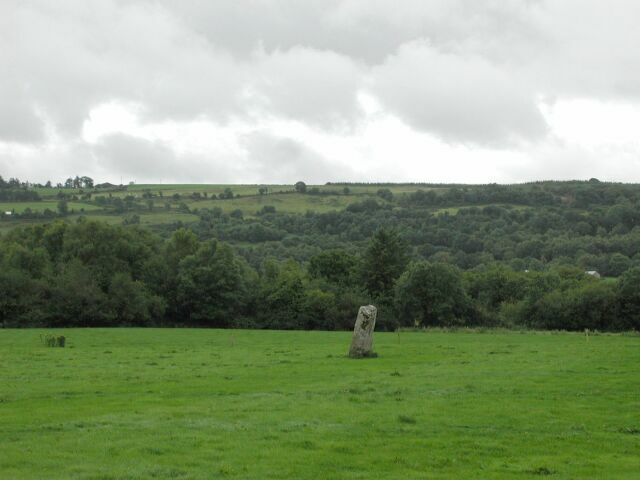 The map said that the first standing stone was only about two miles down the road, and I watched the coordinates tick over until I knew we were exactly parallel with the stone. It had to be about 200 yards off the road on the left. We stopped and Len got out the little binoculars that he had thoughtfully brought on the trip. We saw a part of a ruined tower off to the left, but no stone was in view. The problem here, and as we discovered everywhere else, was that it was almost impossible to leave the road. There was always a fence, a hedgerow, or a wall to keep people off the farmlands – and everything was a farmland. Well, I said, there would be another stone in two or three miles. Forget this one. We biked another couple of miles, and this time we could see a standing stone, a little micro-Stonehenge, just off the road. That was kind of neat, but maybe now we had done standing stones. The pressure was off, and I could ignore them on the map for a while. Unfortunately, we never did see a stone circle, a megalithic tomb, or a ringfort, of which there were aplenty. With our late start it was already approaching lunchtime, and the mountains loomed not too many miles in front of us. There were only a couple of small towns on the way there, so we stopped at the last little town to get some food. We entered a small market or newsagent shop, something like a convenience store. In addition to magazines and food items, the tiny shop also sold clothes and shoes. Needless to say, they were not designer brands! I circled the store about a half dozen times trying to find some snack that I could carry out until I saw behind the counter a deep dish apple pie. So I bought a square of the pie, a coke, and a Cadbury bar. I put these in the handlebar bag, and we biked on, looking for a place to picnic. In my dreams I always imagine carrying a loaf of bread, some cheese, and some wine, and then stopping in a sunlit meadow where I lie back in tall grass and watch the fluffy white clouds drift by. It never works that way in real life, though. Here I was with a piece of pie, and a Cadbury bar, and it was starting to rain, and there was no place to pull off the road. I saw a couple of small roads leading up the hills to my left. They looked interesting, and the road signs pointing up the hill said something like “Nowheresville, 3 ½ hours.” It was the designation of hours, rather than miles that caught my attention. I suppose the roads turned into footpaths. Either that, or these were really tough roads. Soon we found a little stone bridge that led off the main road. It looked inviting, and a little ways in there was an open area where we could stop to eat. While I munched on my pie, I studied the detailed map. Right ahead of us the gradient contours all came together. I was resigned to walking my bike for what looked like a mile or two. By the time we finished eating, it was raining harder. I put my hood on under my helmet and started out grimly. We started going uphill, but it wasn’t too steep, and there was a wide shoulder on the road. This was more like a highway, and quite a few cars and trucks whizzed by us in the pouring rain. I just kept my head down and concentrated on pushing the pedals round and round. The road itself was straight and boring, but I was at least pleased that I hadn’t had to get off and walk yet. I just focused on getting to the next pole, then to a sign ahead. I was huffing trying to get my breath, and I could hear Len up ahead singing. This wasn’t fair! I watched the elevation reading on my GPS. Push, push, push. Another foot gained. The number kept growing – 600 feet, then 700 feet, and on. When the number went over 900 feet, I could see what looked like the crest of the hill ahead. I was going to make it! But just as I approached the final run I got exposed to the wind, which suddenly hit me full force in the face and stopped me cold. That was the end of the line for me. I came close, but I didn’t make it. 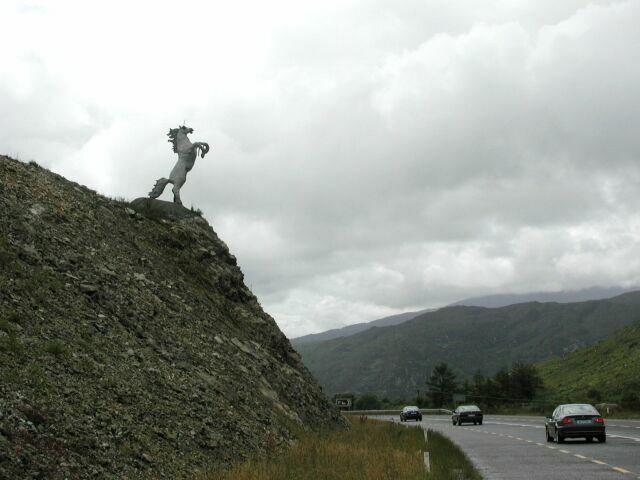 I walked the last hundred feet and stood at the top of the pass, wheezing. There was a plaque at the top, where the elevation gained was 973 feet, and we learned that the road had only been opened a few months earlier. No wonder there was a wide shoulder, and how fortunate we were not to have taken the older road as I had planned. Now for the easy part! We were able to coast for miles. The rain had stopped, and periodically the sun would break through. All I had to do was to admire the scenery unfolding before me. I always hated to lose the elevation I had gained, but eventually we coasted down to where the countryside was level and bucolic. 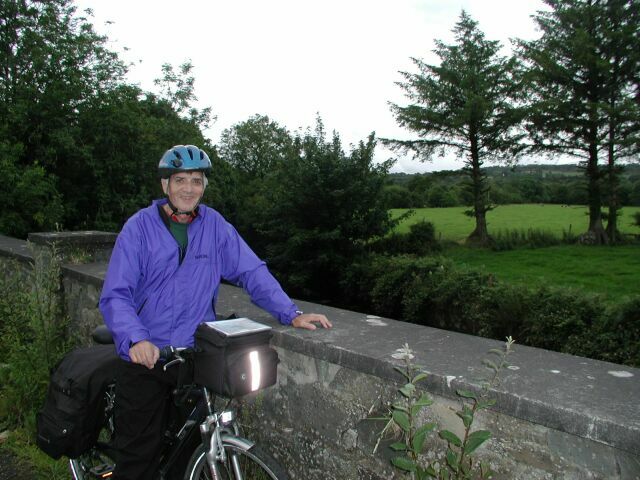 The traffic picked up as we neared the town of Killarney on a flat run. Entering Killarney there was much more traffic than I had expected. It had the feel of a large town, but the guidebooks said the population was only 9,500 and that it was a one-street town. There were cars all around us, and we were amid traffic lights and intersections. Len threaded his way as if he were a car himself, while I was more cautious. He was the one who knew where our hotel was, and he headed unerringly towards it. I thought I was going to lose him as he gained ground on the cars. I imagined that I was going to have to find the hotel on my own, but soon we headed down a side road and unexpectedly, at least to me, there was Earl’s Court hotel. Ray, the owner, greeted us as if we were old friends. He shook our hands, handed us our keys with a minimum of paperwork, and took our picture by the fireplace. Ray took us around the back and helped us lock our bikes in a shed. On the way he introduced us to Simba, which he described as the laziest dog in the world. Simba was sleeping around the side of the hotel, and I stopped to pet the big golden retriever. Simba didn’t seem to take any notice of me, however. I had a wonderful hot shower, and then I watched the Tour de France on television. That was the day that Lance Armstrong effectively won the Tour by powering past everyone on the first big mountain run. I couldn’t help but feel how pathetic I was at biking in comparison. He went up the Alps faster than I even go downhill. Well, he’s younger too. It was about a 15-minute walk into town, and we browsed up and down the main shopping street. The place was really hopping. Maybe there were only 9,500 full time residents in Killarney, but there must have been many more tourists filling the place up. 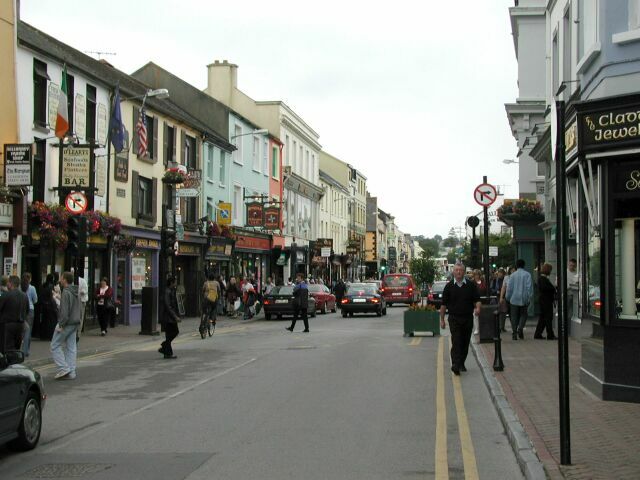 As in Macroom and the other towns that we would visit later, the stores in Killarney were painted different pastel colors. No two stores looked quite alike. We went into a drugstore so Len could buy another pair of sunglasses. The ones he had bought that morning (had it only been that morning?!) had good optics, but didn’t quite cover enough area to give him the protection he wanted. He was looking for a pair of cheap sunglasses now. I mentioned to the salesgirl that he wanted a junk pair, and she seemed a little offended, like they didn’t carry junk stuff. Many stores were obviously aimed at tourists. Practically every store carried Irish music CDs, and there were a number that sold Irish linens, wool, china, and souvenirs. There was a statue of a very old man dressed in a metallic silver outfit in front of one store. Len was saying how the thing might scare children away from the store. Then it moved, and we realized that it was a mime. We searched the street for a restaurant with traditional Irish food, but finally settled for an Italian restaurant named Robertino’s. We dawdled over a nice meal, trying to kill time before the pub music would start at 9:30pm. However, we finished too soon, and decided there wasn’t anything else to do but to walk back to the hotel and rest for an hour or so before returning. On the main street there was a kind of impromptu parade of horse-drawn carriages. These were empty carriages, presumably going back to wherever they slept for the night. In the gathering dusk the clip-clop of hooves reverberated down the street. The horses held their heads high and, at least to me, seemed to exude a strength that belied what must have been a long day of lugging tourists around the sights. Back at the hotel I ate several small boxes of redhots and watched a replay of the Tour de France. 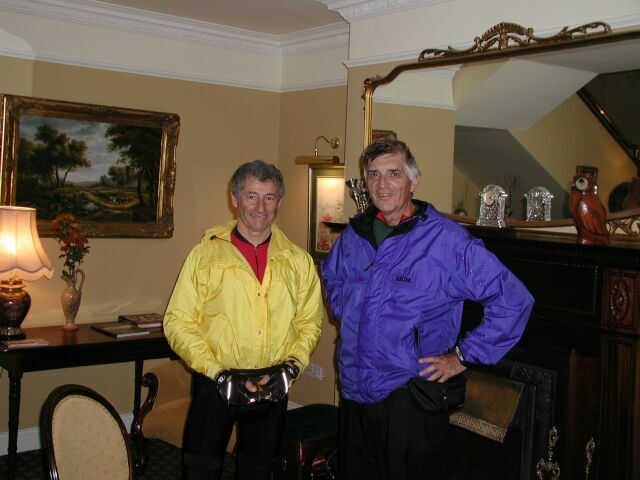 We had been given a whole carton of them at the meeting in Dublin, and both Len and I were carrying a dozen or more small boxes in our panniers. I had to eat them to get rid of the boxes. That was my rationalization. Later, in a pub back in town we nursed our glasses of Smithwicks, and listened to two men singing Irish ballads. One familiar song was Galway Bay. Nearby was a young man of perhaps 19. 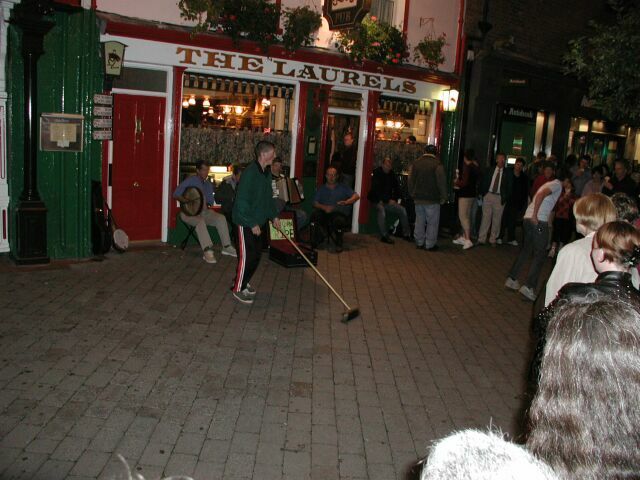 He was also swaying to the music, but when they played an instrumental dance he began to dance in place some Irish jig. It reminded me of the Riverdance. He was really, really good. While he danced he would take occasional puffs from his cigarette. Not satisfied with dancing alone, he started to pull a nearby woman from her table to join him. Obviously she was a stranger to him, and she also was older and fairly plump. She turned red from embarrassment, but haltingly began to follow his lead. As they got progressively into the music he began to twirl her in as expert a fashion as I have ever seen. When they finished she was breathless and still very red. Without another glance she returned to her table, where her companions seemed to regard her in a new light. However, in other pubs we never saw anyone else actually dancing, other than swaying in place. Some pubs even had signs that dancing was not allowed. More to the point, there was never any room for it. The door opened and an older man entered the pub. He was right out of central casting for someone you’d expect to see in an Irish pub. He was wearing a tweed jacket and tie and one of those tweed golf caps with the narrow brim. His face was ruddy and he carried an air of – well -- belonging. The singer acknowledged him to the crowd from his microphone as “Mr. So-and-so has honored us with his presence.” Something like that. The newcomer began buying drinks for people near him. Len and I nudged each other. This was the real stuff. Even though the music in this pub was good, Len and I had a kind of restlessness that demanded that we see what else was in town. Out in the street there was a crowd gathered around a young man dancing on the sidewalk to the music of a little band seated against a store window. There was a scraggly young woman playing the fiddle with energy, but also with seeming disinterest. Len and I were particularly fascinated with the older man playing the spoons. I didn’t know that you could be that good with spoons. We walked into another establishment off a door on a side street. This wasn’t the pub we expected. There was a man singing on the stage, and a silent audience of old people seated at picnic tables. The man was singing “Jerusalem,” the song often heard at Christmastime. A woman seated at an entrance table eyed us, and I felt uncomfortable standing there. As we hurriedly left, Len said that we must have come into some tourist function. It was an unpleasant reminder that this was a town focused on packaged experiences for tour groups. 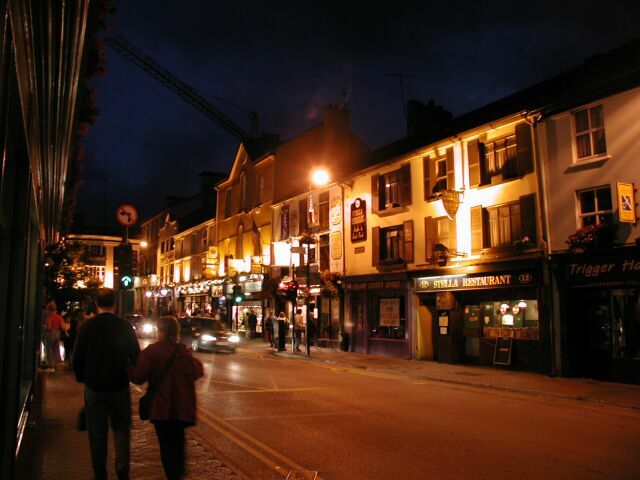 We tried one more recommended pub, which was in a hotel on the main street, where two guitarists and a fiddler were playing Irish jigs. After a song or two, we walked back to our hotel. 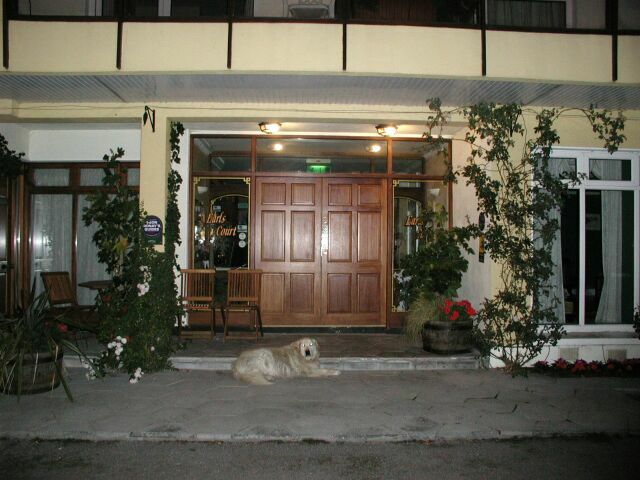 As we approached the front door of the darkened hotel around midnight, there was Simba, lying on the front steps. I walked around him, and he never stirred. He was, perhaps as they said, the laziest dog in the world. But he was at his post.